A B.C. 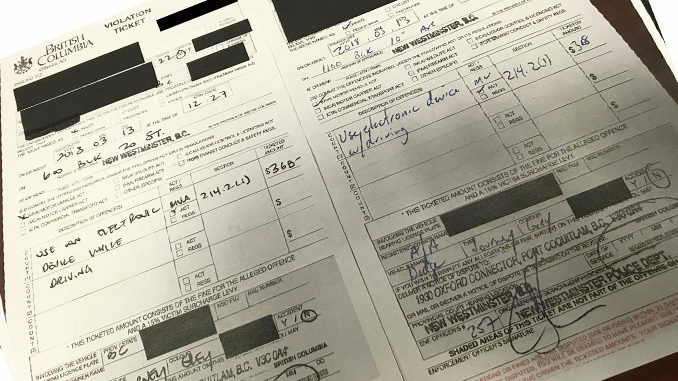 man is facing hefty fines after receiving two separate distracted driving tickets within seven minutes. The 22-year-old was first cited on Tuesday, March 13, at 12:20 p.m. for using an electronic device while driving. Just 7 minutes later, at 12:27 p.m., he was cited a second time, for the same offence. Each ticket carries a fine of $368, plus an eight-point penalty on his licence. It will also drive his ICBC annual insurance bill up by more than $500. Police issued a total of 116 distracted driving tickets over a period of four days at the same location near the Queensborough bridge in New Westminster, B.C. during the distracted driving crackdown. The traffic division of the New Westminster Police Department posted a photo of both tickets on Twitter.